Hip Pocket enthralls the gathering at iBar, The Park, on Saturday. 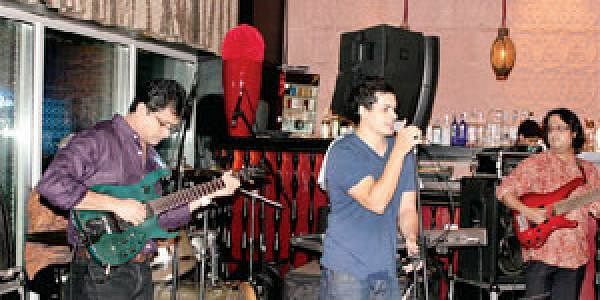 BANGALORE: We play what I like to call “Classic rock of the Woodstock Generation,” says Nondon Bagchi, founding member of Hip Pocket which is a Kolkata-based classic rock band. Hip Pocket took the stage at i-Bar at the Park Hotel on Saturday and had the audience cheering wildly as they belted out classic rock hits all the while adding their own personal signature to every tune they played. Influenced heavily by greats such as Pink Floyd and The Doors, the band nevertheless also paid tribute to other musicians of the time like Elvis, Creedence Clearwater Revival and The Beatles. Speaking to City Express about the origins of the band, Nondon elaborated that the band started off as a group focused on playing for club and dance nights. The roots of Hip Pocket are in pop and dance music and as a result they still do club nights every now and then with Rila Banerjee on the vocals with a set list including music by ABBA and Olivia Newton John. Hip Pocket started performing in the winter of 1996 and within a year had moved on to play at what would become their personal haunt for the coming years. Someplace Else, the pub at The Park, Kolkata decided to add live music to their venue and Hip Pocket started playing there by April 1997. They have never looked back since and are a regular experience to Someplace Else visitors as they play there two times a week now. The band lineup on Saturday consisted of Nondon Bagchi on drums and vocals, Sumith Ramachandran on guitars, Mainak ‘Bumpy’ Nag Chowdhury on bass and vocals, Dominic Saldanha on keyboards and Ben Westley on vocals. All band members also have other tastes in music besides classic rock. Bumpy and Nondon also experiment with Bebop jazz when not playing for Hip Pocket. The others all have had bands of their own playing different sorts of music over the years. The connection that the band members share is what holds the band together. This was amply evident on the weekend gig as the music flowed freely and smoothly from their instruments and ensured the crowd stayed on their feet as they played hit after hit effortlessly and with gusto. The performance included tracks like Have you ever seen the rain, Coming back to life and an amazing guitar solo addition to Wish you were here besides other tracks by Elvis and The Doors. The crowd at the i-Bar, already put at ease by the soft lighting and cosy atmosphere could not stop requesting for more Floyd numbers and the band readily obliged. Having played at varied venues across the city before, we only hope Hip Pocket keeps returning for more.